Fifty years ago today the crew of Apollo 8 sent back this iconic picture of the Earthrise over the moon. The crew were the first humans to orbit the moon. It is, of course, an amazing photo and one that forever changed the perspective of many who saw it then. However, most people alive today were not alive during the Apollo 8 mission, either in the US or in the world at large. That fact also should change the perspective of many who learn it. Today is the birthday of guitar virtuoso Jan Akkerman. His album “Jan Akkerman Live” has long been one of my favorites. Of course he first became “famous” as part of the group Focus, which released the hit single “Hocus Pocus.” That song features some amazing playing by Akkerman. His music evolved to become softer and more acoustic. His ability remains undiminished. Eighteen days before we leave for Arizona and the big Barrett-Jackson auction and no Avantis or Studebaker Gran Turismo Hawks are listed on the docket. Of course, if the stock market keeps tanking I might not feel comfortable about spending a large chunk of capital on a car purchase. Then again, you only live once. The number of Mustangs on the docket? I grew tired of counting at about 40; I would bet the number of Mustangs/Shelbys is in triple digits. While I am not crazy about the white vinyl top, this 1966 Pontiac GTO is a restomod powered by a giant 505 cubic-inch V8 with a stated output of 550 HP/550 LB-FT of torque. It has a 200R4 automatic transmission. I have seen that same transmission (I think) listed as a 200-4R. Is it the same? Does anyone know? Yes it is. 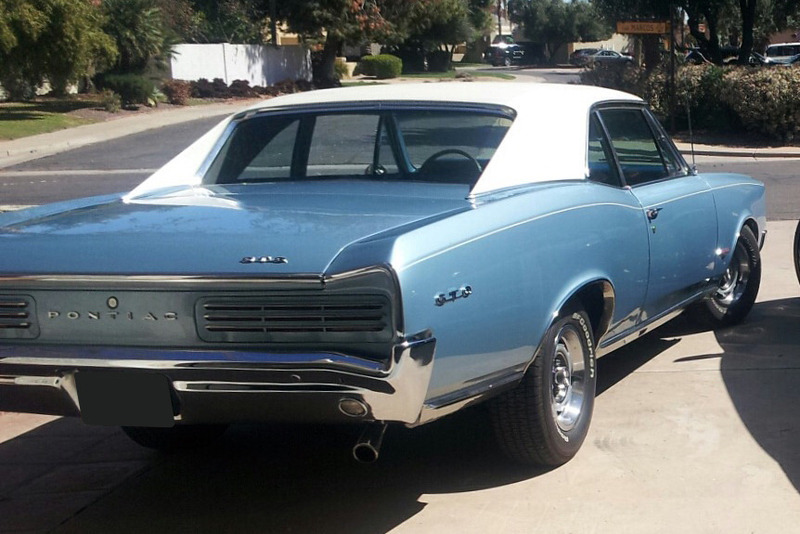 Have it in my ‘66 GTO and makes for a much better driving experience. Thanks, tlpdds1. People are entitled to their opinions, but I also think that modern automatics make for a much better driving experience than manual transmissions. Happy Holidays to you! 200R4 is correct nomenclature, it is an older 4-speed automatic, not a manual and can be used with almost any GM engine. The 700R4 is able to handle more power than the 200, but stick with at least a 4L60 or 4L80 behind a modern powerplant like an LS….it will be a more seamless fit, albeit more expensive as the 200/700’s are only electric overdrive and require only a mechanical cable to transmission for proper operation. Thanks, but even if I lived near the auctions or AZ I certainly would not go….buying at auction is always a lost cause. Too much machismo and booze for my liking. Plus here are some tidbits of learned knowledge that might help in your endeavors….not that you probably have not been to an auction and will use your head anyways, but people tend to get caught up in the emotions and thoughts go out the window…. -Assume you are buying the vehicle for a client: would you be 100% comfortable presenting “this” to “them”? -Remember, if what you buy turns out to be not 100% what you want, or is pretty but poorly built when you take delivery, you can always unload it at the next auction as many do. They go from BJ to Russo to Mecum if you watch closely. Many thanks, Steve, for your thoughtful and thorough reply. I will take your advice. I have already put myself on an absolute budget that is far less than our “approved” amount. I am leaning towards buying instead of building, in no small way due to your recommendation. Happy New Year! Happy New Year and will await pics of your new ride….should you so decide this January! Thanks again, Steve. The probability that I acquire the car I desire is no more than 10%. I have set the budget, including buyers premium, at about half of the likely price of a custom build. My strong hunch is that since the car is supposed to be sold on the last Saturday with the majority of the most expensive cars, the “Saturday effect” will push the price beyond my budget.